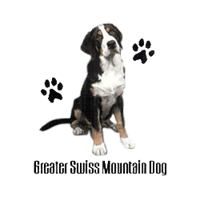 The Greater Swiss Mountain Dog (Grosser Schweizer Sennenhund) is considered to be the oldest and is the largest of the four Swiss Mountain Dog breeds — The other three being the Bernese Mountain Dog, the Entlebucher and the Appenzeller. He is descended from Mastiffs that came to Switzerland with the Romans. Like the Bernese Mountain Dog, he was used to assist farmers and butchers by guarding and driving livestock and pulling carts. He was also used to track and as a search and rescue dog. Today, the Swissy is mostly a family companion and is noted for his gentle nature, loyalty and wonderful disposition. He is easygoing, obedient, bold and faithful. He loves children and makes an excellent watch dog. The powerful dog is always alert, vigilant, energetic and eager to work. His double, weather-resistant coat is short and thick, and the typical Swiss tri-colour — deep, lustrous black with white and tan trim on the feet, face, chest and tail. The Greater Swiss Mountain Dog is known to be a healthy breed. However, like all breeds of dogs, certain health problems have been found in the breed, including Hip Dysplasia, Elbow Dysplasia, and some eye problems including entropy and ectropion. In addition, as with many large breeds, Gastric Torsion or Bloat is a real possibility in the Greater Swiss Mountain Dog. If you are not familiar with this condition, it is absolutely necessary to learn about it and know the symptoms – This is a real emergency and a life threatening condition that requires immediate Veterinary attention. See Gastric Dilatation Volvulus (GDV) – Bloat in the Health and Nutrition section of Canada’s Guide to Dogs for more information and First Aid for Bloat for an article describing some of the things you can do if you are faced with this situation.